Hoping to get back to posting regularly starting November. Ive been preparing for some things Ive got going on this week. For one, I have test this week Secondly, I’ve been subpoenaed to court(that could be anytime between Monday through Friday. P.S. I am witness, I am not the one on trial.). And I’m still trying to get job interviews as well. Due to that last note, I don’t currently have money of my own, so I have not been able to purchase mangas or anything of that nature. I did get Yoshi’s Woolly World though. The first week of November I am hoping to showcase it. I am also planning on highlighting some of the new animes. And of course, We’ll give a shout out to all the awareness’s for November. So that’s upcoming at the start of next month! Hope everyone is having a great weekend! Hey guys, this was suppose to be last weekends top five in honor of BFZ, but I was internetless this weekend so I am bringing it to you guys today. This is a list of five cards I am eager to use and see if they make any kind of impact in any of the formats. Note: these are not the five best cards or even five sleepers. Just five simple cards I enjoy the idea of. #5 Ugin’s Insight– So far I have not seen too much love for this card. Maybe it’s two slow, maybe they hate that is sorcery speed. I don’t know. All I know is Scry X, then draw cards sounds super sweet to me. I know this doesn’t replace Dig Through Time time since you’re casting DTT for 1 blue at instant speed, but this is pretty sweet too. It kind of gives itself a safety valve with the scry to help you try and hit your three best cards. I thinks it solid on a turn youre not doing much on. Even better if it’s late game and you cast this after you already ultimated with Ob Nix. It can then act as 6 burn damage as well as drawing 3 cards. For me the only thing holding this back from a top two spot is the fact it is sorcery. #4 Ruinous Path– Yet another card that isn’t getting much love because it’s a sorcery speed. 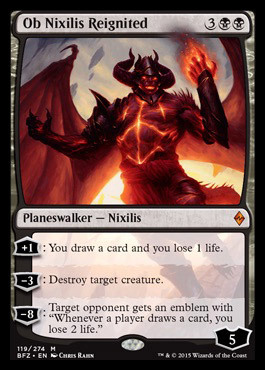 Well, If there is one thing I do not want to happen to me, it’s get wrecked by a planeswalker. This is one of the only cards to hit planeswalkers(This and Quarantine Field and a few others come to mind). Yes, Instant speed makes this a top one or two, but since its not, it gets number 4. #3 Greenwardern of Murasa– The only bad thing this has going for it? 6 drop. Other than that, it’s a bulkier Den Protector who can bring back two cards! Yeah, it’s is pretty sick for anyone who wants to do graveyard tricks. Just look at the card, it should speak for itself at this point. #2- Stasis Snare– My vote for best removal in BFZ and maybe in the format right now. 3 drop flash, exile any creature until this card goes away and unless your’e running Sultai Charm you probably are not packing much to deal with an enchantment game 1. Plus, I infinitely love exile over killing. #1 Ob Nixilis- I know, no love for Gideon? Not quite. Ob has already cooled down and headed towards the single digit(Not that he will hit there. I don’t know). But Gideon just doesnt do much in decks I want to build. As for Ob, he draws cards, kills stuff, and puts a clock on the game with his ultimate. I just see much more going for Ob. think people know how good Ob is so there is not much to add. He is good. Honorable mentions: Gideon, Kiora, Lifespring Druid, Transgress The Mind. So what cards got you guys wanting to go play or build decks? Leave them in the comments! One of the first places to start when building a deck is to choose which colors you want. Heading into this standard, I wanted to play some from of Esper(White/Black/Blue). Blue has counter magic, black has removal, white has Ojutai. Well I was looking over what Black lost, and well, it’s a lot. For starters, and probably what has everyone the saddest, whether you run Esper or Abzan(Green/Black/White), is no more Hero’s Downfall. 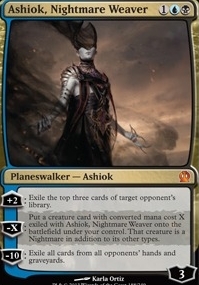 Black is also losing Bile Blight and Silence The Believer and Drown In Sorrow, and maybe almost as heavy as a hit as losing Hero’s Downfall is losing Thoughtseize and Ashiok, Dream Weaver. So what does black magic still have? For Esper, still a good bit of stuff. For Abzan, not as much. Abzan only has two cards left over: Languish and Ultimate Price. Oh and Sorin if you want to count him. Esper has a few more toys to work with. They still have Foul-Tongue Invocation, Crux of Fate, as well as having Ultimate Price and Languish too. What is Black gaining? They get Ob Nixilis Reignited who looks GREAT. They get Ruinous Path which will probably be as relevant as people are thinking it will be. They get Rising Miasma the poor man’s Languish/worse Drown In Sorrow. And Bone Splinters whose sac clause might be too demanding for control players but fits well in a more creature heavy deck. The Devoid Black cards are where the set shines in my eyes. 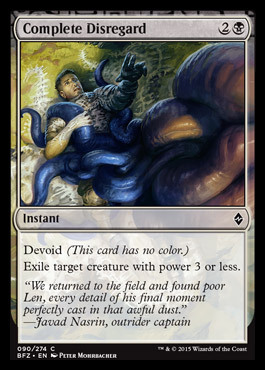 Devoid Black gives us access to Grip of Desolation, which gives the chance to disrupt their tempo while exiling their creature, Transgress The Mind which is new hand disruption that stops Siege Rhino before it ever hits the field, and Complete Disregard that exiles Hangarback Walker and allies. Other black cards still in the format include: Utter End, Self-Inflicted Wound, and Reave Soul. So how do you guys feel about black as far as Standard Control goes? Did what it gain make up for what it lost? Are Esper Control and Abzan Control/Midrange still reliable decks?